A report from the 2016 Pumpkin Cup that took place this past weekend (Oct 15-16) in North Texas! 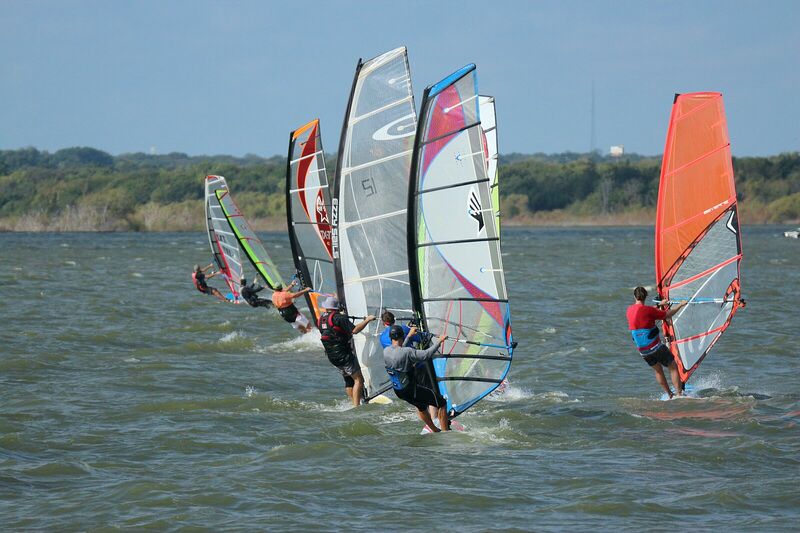 Dallas – Fort Worth sounds like an unlikely place for one of the surviving windsurfing strongholds in the country. 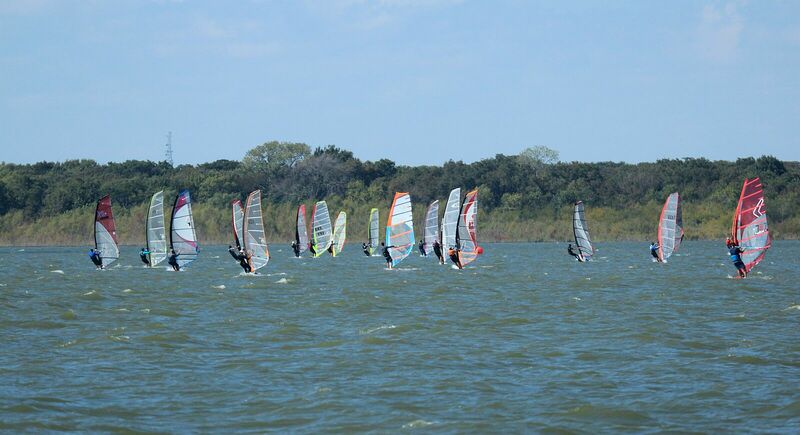 But then if you consider the number of large lakes in the vicinity, a great shop in Mariner Sails, and a strong club in the North Texas Wind Riders (NTWR), you will begin to see why! Windsurfers from my generation like to sit around and ponder the decline of windsurfing from its heydays in the 1980s. There are many theories, and many proposed solutions. But there’s little doubt that a key ingredient for the rebirth of the sport is the type of grassroots events we’re starting to see more and more around the country. The Pumpkin Cup has been around for a long time, but it’s got that grassroots energy that’s absolutely vital to our sport. The Pumpkin Cup is one of two very successful events that the NTWR hosts every year (one in the spring, the other in the fall). And their success starts with the people. NTWR members pitch in at all levels to get these events off. It has been spearheaded by Aris Tsamis for as many years as I can remember, and his unique personality and sense of humor bring this event alive. The race director is John Steadman, who, despite being an able competitor himself, selflessly runs the races. He even traveled to the Nationals in Corpus this year just to run a comparison with his event. I know he has a goal to be the biggest and best event in the country! Of course, a windsurfing event needs wind. For the most part the chances of the North Texas area delivering at this time of year are good. For the Pumpkin Cup this year, we had winds in the 10–25 mph range, and these were the best winds in the state for that weekend. Lake Lewisville is like any other inland lake: The winds are shifty, gusty, with big lulls and also big gusts. There is no such thing as the right-sized sail, and that presents an interesting challenge for sailors of all levels! And sailors of all levels is what you will find at these events. 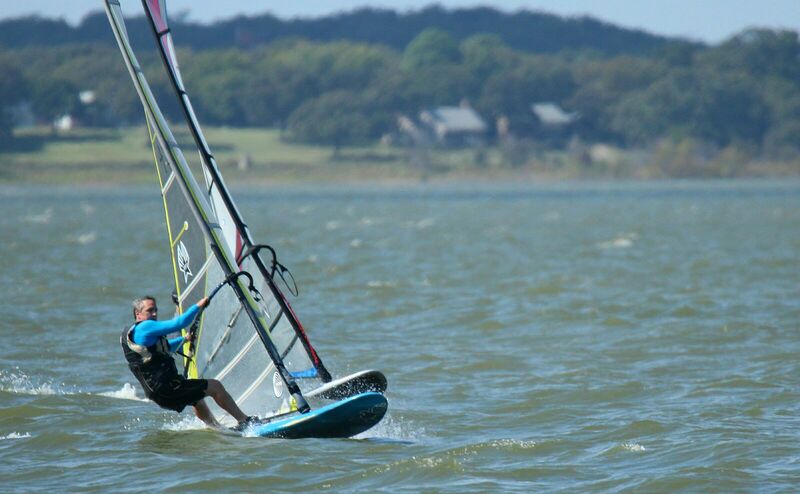 Windsurfing events can be intimidating for novices and intermediates, but not this event. There are fleets to suit all types of boards and all skill levels. You will see an eclectic collection of windsurfing equipment, from the latest industry offerings to some true grassroots equipment. Longboards, Konas, slalom boards of yesteryear, Formula boards, freeride boards. Typically two courses are set one: upwind-downwind for Formula, and the other a downwind or figure eight slalom. On this occasion, the Formula racers used the slalom course, although they did get their own start. This made it possible to get off a large number of races over two days. I left my Formula board in my trailer, and had fun with slalom instead. There is nothing quite like putting the hammer down on a slalom board fully wound in a big gust! While it would be nice to have an on-the-water start, it isn’t really necessary. Here, the racers lined up on the shore and received a three-minute sequence. No excuse for missing the start! Of course, a beach start isn’t without its set of challenges, and sometimes one end of the line is heavily favored. But it is probably also the easiest way to start for all sailor levels. We keep coming back to that format. A good venue is another must-have! After rotating through different venues over the last thirty years, NTWR seems to have hit the jackpot with the Dallas Corinthian Yacht Club. Great facilities and a warm welcome from its members. A huge grassy area for rigging and camping, and an easy sandy launch in predominantly side-shore winds. The weather was perfect for the whole of this event, not too hot but very warm, no clouds, and no rain. In the past, campers have had to run to the clubhouse for shelter in the middle of the night, but the weather was kind this time. For those not so keen on camping, nearby hotels offer a good night’s sleep. Many people reading this know Ken Merten, a fixture at every US Open race and many Nationals, and also an NTWR member. Ken recently retired to North Carolina, but makes the trek twice a year to come to these events. He doesn’t just show up, he wins races despite now being in his seventies. We all hope to be like Ken when we get older! All good things eventually come to an end. But not before the giveaway raffle and awards. Aris can make you laugh or cry at these. When there is a big prize on the line, such as a free ABK camp, he typically reads the winning ticket numbers so slowly that the suspense is agonizing. For this event there were booby prizes of pumpkins thrown in with the more on-topic prizes. 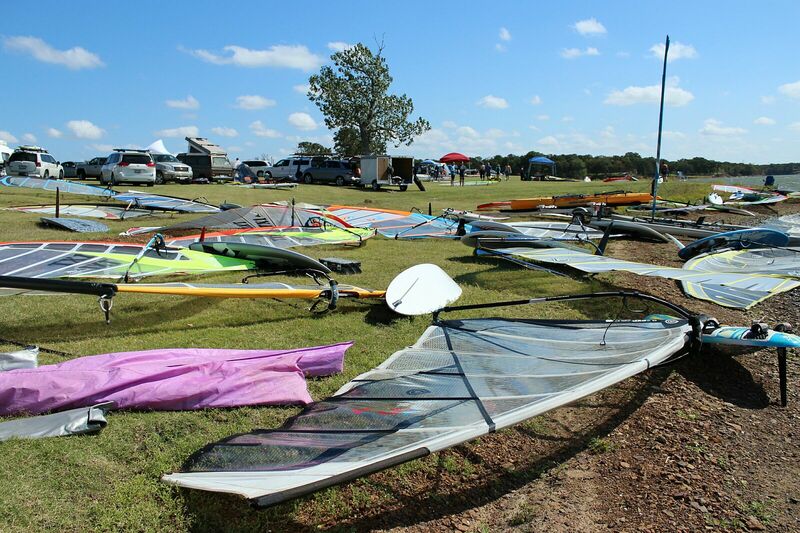 Aris had some great sponsors for this event: Mariner Sails, Dallas Corinthian Yacht Club, ABK BoardSports, Sailworks, Ezzy Sails, Dakine, Chinook and North Texas Wind Riders! So while not everyone wins the big prizes, everyone is a winner, and a lot of people leave with smiles on their faces. The final bonus: Yseult and I got a solid glimpse of a USAF Thunderbirds air show at Alliance airport as we headed home along I35W. Yes, I did keep my eyes on the road! I just read this and I have a question or two. It appears that this is a regatta that is for windsurfering but it is not a 1 design regatta? I raced Sunfish for many years and before that I did some off shore racing. 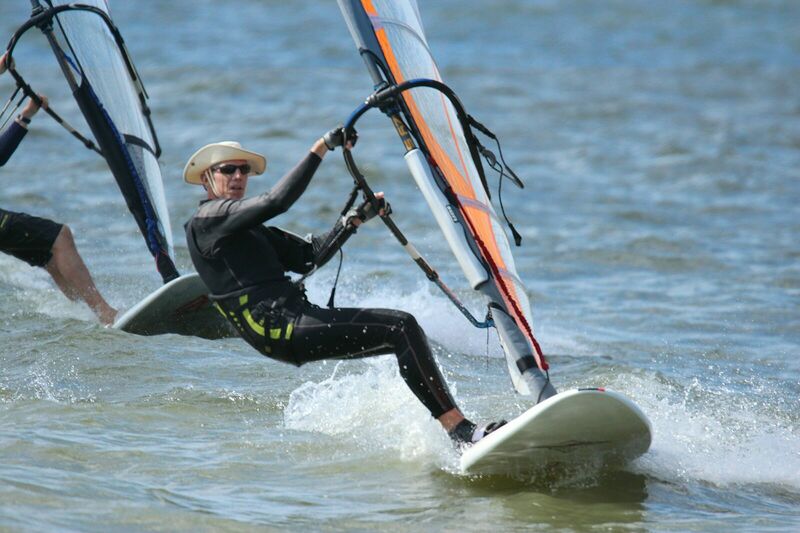 I had fun tooling around on the original Windsurfer but never felt competent enough to race. I always found windsurfering to be the ultimate sailing. Hands on the wind, feet on the water. It is definitely not a one design regatta. It was structured so people could race whatever equipment they owned and be competitive with people on similar equipment. The format was downwind slalom, which meant there was no need for specialized upwind equipment. That being said the wind was very shifty, sometimes making the first mark tricky to get to in one tack. So three buoys two outside and one inside, and the finish downwind of the start. Next story Beth and Andy’s Kona Diary! Previous story If you build it, they will come!